The mission of this club is to provide the opportunity for the maniacs of film photography to check out each other's works, learn new tips, complain about the high prices of C41 and many more whenever they come out of their home darkroom. Holga-freaks, home-made camera obscura owners, film photographers, joins us today! We collect everything taken by Holgas, other toy cameras or even the photos you took with the old film camera of your daddy that you found in a box in the attic. We love cross-processed films and slides, lomography, polaroids (especially with expired paper ), so basically everything that's somehow related to the crazy, dark passages of film photgraphy Please DO NOT contribute however photos taken with modern high-tech cameras, on modern professional non expired films processed in their intended chemistry. Feel free to contribute any kind of film photography that's related to the above mentioned toppics or even those that I might miss metioning! Everyone can join as a member, and members can contribute art, but their contributions will be reviewed. If someone wants to see your entire gallery, (s)he will visit you, so just post your very best. Deviants particularly experienced in the field of film photography may request Contributor privileges. Contributors can submit their deviations without review! Please only request contributor privilages if you already have at least 5 accepted contributions. Do not get offended if your deviation gets rejected. This is a moderated group that means everyone's submissions are reviewed by the founders or contributors. This is no censorship, our aim is to ensure high quality and keep the number of contributed deviations reasonable. What we really desire to see is photography that is perfect in terms of composition, exposure, concept, etc... So in long term we would like to see lomography that would be quality without the 'lomo effect' as well and it only adds to the already magnificent experience. TOY CAM Lo-Fi Photography is the result of over a year of hard work by photographers for photographers. This book features over 100 photographs by 49 artists of various styles, nationalities, and cultures to highlight the versatility of these seemingly simple cameras. Several photographers are also interviewed to gain in-depth perspectives of their work. TOY CAM Lo-Fi photography is a celebration of the art of plastic cameras, and a dedication to those behind the toy camera movement. After all, almost a year of waiting... This book finally appears, and of course I couldn't withstand my excitement as my 2 Holga 120GN photographs have been featured in this marvelous TOYCAM book, which are occupying two different genres, scapes and people. In the last few weeks group activity declined due to summer. This wouldn't be much problem if there were enough group admins left to deal with the incoming submissions, but as it seems last week a lot of your submissions expired before they got voted on by enough admins. As a solution to that I re-submitted all of these deviations. I hope this time they will make it through the voting process Sorry for any inconvenience! I've been away from DA for almost 9 months and during that time many things happened, good and less good. So let me tell you about the good things, or better, the best thing, which is my start with the wetplate collodion process, a process I fell in love with the first time I saw some plates at a demonstration some years ago. This article was originally published in VernonTrents journal. Since I felt that the members of this group might be interested in this very old, somewhat forgotten technique I asked him if I can re-publish it here. As for the process, Frederick Scott Archer described 1851 an application of salted collodion on sheets of glass for the purpose of making glass plate negatives. He detailed a process where potassium iodide was combined with a solution of diluted Collodion (diluted with alcohol and ether), applied to a glass plate, which was then immersed in a silver nitrate bath resulting in a light-sensitive layer of silver iodide. Well, that sounds pretty simple, which actually is. The important part in this process is the security. You need to get familiar with the chemical hazards associated with this process, as most of the used chemicals are flamable or explosive, as well as poisonous. You need to burn this in your brain. Improper use can cost your life! In the next lines I will try to describe the "birth" of such an image, so you get a clue what happens behind the scenes. First of all you will need a camera that is able to hold a substrate (glass plate, aluminum plate). View cameras with modified film holder can be used as well as wetplate cameras that you can order from designated manufacturers. In order to stay timely with the process, 1850 and later, most collodion afficionados use camera designs and lenses from that period. Below you can see my camera, an 8x10 Anthony Style Bellows camera, built by Ray Morgenweck of Starcamera Company, NJ. Is a cherry wood replica, built after original plans. The lens is a french Derogy No.4, an original from 1869 (according to the serial number and VadeMecum). Ok, so let's move to the next steps. this is the glass plate that will cary the image scrupulous cleanliness is required. cleaning the substrates avoids that the collodion will peel off and your image is free of spots. pouring the salted collodion. this is the layer where the image will be created. silver nitrate bath. it makes the collodion layer light sensitive. The final image can be now varnished and is ready for framing. Clear glass negatives can be used for further process, such as albumen or salt prints after intensifying, or create contact prints on traditional silver gelatine paper. If you wonder about "slow photography", here's the reason why. Unless you have an assistant that is cleaning, pouring, sensitizing and developing plates for you, you need to expose each plate right after the plate is in holder and still wet, hence the name "wetplate". All that takes its time, usually 15 mins per plate. Another point for "slow photography" is the fact that the used collodion has an ISO value less than 1 (yes, ONE) and the most common exposure time is ~5 seconds depending of the light quality and the amount of UV light. 5 to 10 seconds are ok for portraits, most people can deal with it. For still lifes and landscapes it doesn't matter. Thanks for your time, I hope you have enjoyed the reading. So here it goes! A feature for our future contributors who will vote on your submissions. Bare in mind that we may add new contributors later, especially because some of the people we explicitly asked if they wanted to join as a contributor didn't answer yet! The many faces of analogue. The founder of our affiliate lomography group. Let me quote: "I can't remember when I shoot on NOT expired film!" New voting system needs contributors! WE WANT YOU! Running a group is a huge responsibility, and sometimes it's very hard. If one allows too much, than people complain about the high amount of low quality entries in the group stream, but every member being declined gets upset to some extent. Every time we press the yes or no button we have to make a responsible decision, and in some cases we are pretty far from being sure that it was the right one. As the group is growing we realized that we don't have the time anymore to give reasons for everyone complaining about their own declined or others accepted deviations. So here comes the deal... let's share this responsibility! About 5-10 minutes of work a day! The system we would like to introduce in this group is already working at Stereoscopy. We would like to choose up to 10 privileged members (contributors) who will vote on each entry. Each voting will need 3 yes or 3 no for a decision. That way it should not take much time for people to make a decision... At Stereoscopy contributors work about 5-10 minutes a day to keep the group running, and since the system was introduced we rarely get complains about the decisions. When ever we do, than there is always someone who can give a reasonable explanation to the member whose deviation has been rejected. But how do we select the contributors? May 7, 2010 New voting system needs contributors! WE WANT YOU! Dear fellow deviants. I have a Kickstarter project that is ending in about a week. At this point it is only 30% funded. PLEASE take a look and consider supporting me, AND please share the link with at least one other person. (If that person is incredibly wealthy, that would be even better!) 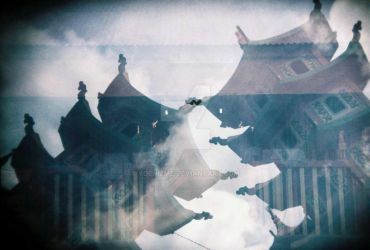 It will be good for your art karma . .
What about using Holga lenses & Old-school filters on DSLRS? As i've managed to Jury-rig a Sunagor Super-Wide 0.42x 55m adaptor onto a Holga HL-PGL meniscus lens (minus the vignetting filter built into the back of the lens, I prised it out). The effects are very similar, but would those pictures qualify? Or are you strictly film only? I'm a holga newbie. How can you tell a photo is faked? I'm totally curious. I was talking about this with my friend and I started saying: "i wanna say that there tend to be signs of it being photoshopped most of the time, and there are signs of digital modification at times, that tend to show in the resolution, but i'm not 100% sure. It'd be easier to describe if one has more experience in spotting photoshopped images..."
"Have you ever noticed photoshopped images often lack two important traits of Holga photos? Two overlooked but very important aspects of Holga images"